“If only the New Left and the ‘youth culture’ that coexisted with it had been as threatening to the US government as the latter seemed to believe. 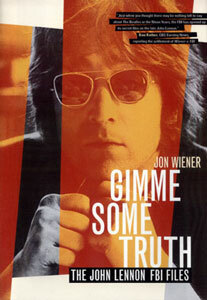 That wistful thought occurs while perusing this chronicle of the Nixon administration’s harassment of John Lennon for his involvement in radical causes during the early ’70’s. . . . For all the unintentional humor that pervades these documents, they convey a far more sobering message: how willing the governement has been at times to spy on, intimidate, and harass those whom it regards as its most effective critics.” – – Mother Jones, Nov./Dec. 1999.